He’s baaaaaa…ck! Judge Tom that is, with his latest book in the Teens and the Law series for Free Spirit Publishing. This time he collaborated with his daughter Natalie (that’s me) to inspire youth today to find their voice, share their voice and become active, engaged members of society. 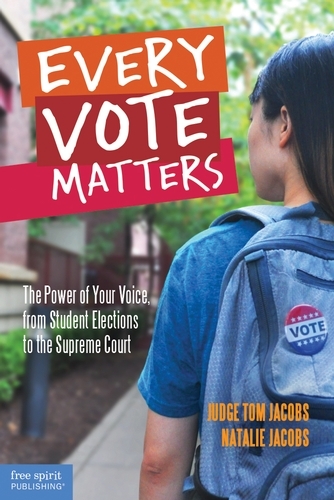 Their book, Every Vote Matters: the Power of Your Voice from Student Elections to the Supreme Court educates, inspires and empowers teens and young adults to become informed about important social issues affecting our world today and to participate in our democracy. Every Vote Matters explores the history of voting in this country, voting rights and the election process. The second part of the book discusses major Supreme Court decisions that were decided by just ONE vote. Because the president nominates Supreme Court justices who can sit on the Court for life, our vote for the president has an effect on who’s appointed to the Supreme Court. Their decisions have serious implications on how we live today. The issues discussed in the book include free speech rights for students, search and seizure laws, public education for all, prison sentences for minors and more. Even if you can’t vote yet, you CAN get involved! You CAN use your voice to bring about change. You CAN become an advocate for a cause you believe in. Every Vote Matters will give you the information and tools you need to make a difference one vote, or one voice at a time. The next president elected in November will nominate as many as four Supreme Court justices! Considering there are only 9 justices on the Court, the next president is looking at filling almost half the Court if in fact those justices choose to retire. In the 2012 presidential election, it’s estimated that 30 million young people did not vote. Millennials have the potential to make up the largest voting bloc in our country, so get out there and tell America what you want!